FENDER Hot Rod Deluxe III SPEDIZIONE GRATUITA!!! Il più noto amplificatore valvolare del mondo è ancora migliore! Gli amplificatori Fender® serie Hot Rod si possono trovare su qualsiasi palco del mondo, grande o piccolo che sia e sono utilizzati da chitarristi che hanno scelto diversi “percorsi di vita”. Altoparlanti Celestion A-TYPE da 12". Altoparlanti: Celestion A-TYPE da 12", 8 ohm. 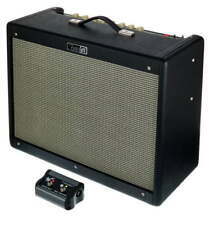 Fender Deluxe Hot Rod IV Amplificatore Per Chitarra. Queste le caratteristiche principali di uno degli amplificatori più amati al mondo, ilFender Deluxe Hot Rod IV. El Hot Rod Deluxe se ha convertido en el amplificador a válvulas más vendido del mundo. Incluye cable de altavoz y funda de protección. Fender Hot Rod Deluxe IV Guitar Amp Combo, Black (nuovo). 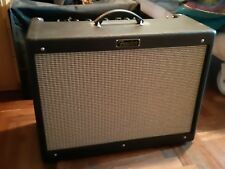 Fender Hot Rod Deluxe IV Guitar Amp Combo, neri caratteristiche principali. Una versione aggiornata dell'amplificatore leggendario che è stata il cuore di molti chitarristi rigs, il circuito di Hot Rod Deluxe IV caratteristiche preamplificatore modificate, riverbero a molla dal suono più liscia ed estetica aggiornata che qualsiasi giocatore è sicuro di apprezzare. Pino ligero, pero fuerte, se usó para fabricar amplificadores Fender en las décadas de 1950 y 1960, lo que generó recintos de altavoces más resonantes y más musicales. El circuito del preamplificador modificado ofrece una mayor definición tonal y claridad, incluso cuando exiges al amplificador con el overdrive, por lo que su tono permanece articulado sin importar cuánto lo exijas. Die Marching-Abteilung bei music world hat es ebenfalls in sich. Hot Rod Series. music world brilon. 1x 12' Celestion Creamback Lautsprecher. 3x 12AX7 Vorstufenröhren. 3 Kanäle (Normal, Drive und More Drive). Le Hot Rod Deluxe IV comprend un haut-parleur 12 "de type A Celestion® pour une sortie bien équilibrée avec des aigus doux, des médiums équilibrées et des graves arrondis. Le circuit de préampli modifié améliore la définition des notes saturées, vous offrant ainsi un son bien articulé. Die Marching-Abteilung bei music world hat es ebenfalls in sich. 3 Kanäle (Normal, Drive und More Drive). zweifach Fußschalter und Schutzhülle. Hot Rod Series. music world brilon. Surf Green Textured Vinyl und Wheat Frontbespannstoff. - Hot Rod Serie. - Gewicht: 18,59 kg. - Chicken Head Style Knöpfe. - Lautsprecherbestückung: 1x 12" Celestion G12M-65 Creamback. - Maße: 47,6 x 59,7 x 26,7 cm. Gehäuse aus massiver leichter Kiefer. - 2 Klinkeneingänge - Eingang 2 mit -6 dB. - Hot Rod Serie. - Gewicht: 18,59 kg. - Chicken Head Style Knöpfe. - Lautsprecherbestückung: 1x 12" Celestion A-Type. Amplificadores perfectos para conseguir tu propio sonido y muy sensibles a cualquier pedal de efectos. Presenta el característico sonido a válvulas 6L6 y un versátil preamplificador a válvulas, incluyendo un frontal 12AT7 para un sonido más limpio, en especial si se combina con pastillas humbucker. Caratteristiche RockBag RB 80671 B. Produttore :Rockbag. Cover in nylon per Fender Blues Deluxe 112, Hot Rod Deluxe 112. Rispondiamo a qualsiasi comunicazioneentro 24 h dalla ricezione. Prodotto :22215. PERMUTIAMO IL TUO USATO ANCHE A DISTANZA! AMPLIFICATORE VALVOLARE PER CHITARRA. Lo standard per i chitarristi concertisti di tutto il mondo e l’amplificatore ideale per dar vita al proprio suono personale. I’ve played it for years and it’s been such a staple for my sound. This is an all-tube combo guitar amplifier featuring a pair of 6L6 tubes for the power section and two 12AX7 tubes for the preamp section. Fender Hot Rod Deluxe Limited Edition with sought after 40 watt Jensen speaker. Speaker cable has been upgraded as you can see on the photo. Set of JJ Slovak tubes in at the moment with 2 x Electro-Harmonix 12AX7. There are a full set of Grove Tubes chucked in. Also a Fender foot switch and a Carl's custom speaker soak so the tubes can be opened up at low volume. I do not want to sell but needs must. This is a beautiful sounding amp with haunting reverb. Excellent Effects Loop and sounds meaty with distortion through the front end. Happy bidding someone is getting a great amp. ,Condition is Used. Dispatched with eBay delivery – Shutl 1 day. I can also personally deliver if you are within 150 miles. 8 Ohms impedance; 80 Watts RMS power handling. Speakers: 1-12" Celestion® G12P-80, 8 ohm Speaker. Weight: 41 lbs. (18.59 kg). Impedance: 8 ohms. GAK Saving: % OFF. RRP £ 0.00. Code: 7508. All Categories. An updated version of the legendary amplifier that's been the heart of many guitarists' rigs, the Hot Rod Deluxe IV features modified preamp circuitry, smoother-sounding spring reverb and updated aesthetics that any player is sure to appreciate. The last 6 pictures are of the Actual Fender Limited Edition Amp. these are hard to find, they are sold out most everywhere! An updated version of the legendary amplifier that’s been the heart of many guitarists’ rigs, this Hot Rod Deluxe IV features an Eminence® Cannabis Rex speaker, modified preamp circuitry, smoother-sounding spring reverb and updated aesthetics—flaunting blonde textured vinyl with oxblood grille cloth. This is a new for 2019 Fender FSR Hot Rod Deluxe with a special Buggy Whip tolex covering! It features a modified preamp circuit for a smooth and clear sound even under higher gain settings, improved spring reverb, and a wheat colored grille cloth. Fender hot rod deluxe Tweed amp 1×12 - Upgraded Speaker, Footswitch & Custom Tubes and Fender Cover. It's barely been Used at all and is in EXCELLENT CONDITION. He was right. I noticed instantly that my amp now had the ballsy low end rumble that it had lacked before. • UPC: 885978878116. An updated version of the legendary amplifier that's been the heart of many guitarists' rigs, the Hot Rod Deluxe IV features modified preamp circuitry, smoother-sounding spring reverb and updated aesthetics that any player is sure to appreciate. 2019 LTD Edition Fender Hot Rod Deluxe IV Buggy only 200 made! This LTD edition is a n updated version of the legendary amplifier that's been the heart of many guitarists' rigs. 2 x 6L6 Endstufen Röhren. Anschlüsse: externer Lautsprecher, Fußschalter. Alle Marken und/oder Logos sind Markenzeichen, Warenzeichen oder eingetragene Warenzeichen der jeweiligen Inhaber. Farbe: Lacquered Tweed Covering, Black and Gold grille. Rectifier: Solid State. Fender hit 2018 with new versions of their excellent Hot Rod series of amplifiers, with the Hot Rod IV series launched at NAMM! An updated version of the legendary amplifier that’s been the heart of many guitarists’ rigs, the Hot Rod Deluxe IV features modified preamp circuitry, smoother-sounding spring reverb and updated aesthetics that any player is sure to appreciate. This Fender FSR Hot Rod Deluxe IV A Type is a limited edition amp with an upgraded Celestion A-Type speaker and black and gold grille. Furthermore, that tweed style casing gives them an excellent, classic look. Fender hot rod deluxe. Special edition. New preamp valves "mullard". • UPC: 885978283514. The GB Hot Rod Deluxe „ is a 40-watt 1x12" combo especially fine-tuned for world-famous jazz guitar virtuoso and pop artist George Benson. Standard features include clean and "drive/more-drive" channels, resounding Fender spring reverb, effects loop and more. With unmistakable Fender tone and great responsiveness to stomp-box effects, guitarists of all kinds will find it ideal for crafting their own sound. Standard features include clean and "drive/more-drive" channels, resounding Fender spring reverb, effects loop and more. An updated version of the legendary amplifier that’s been the heart of many guitarists’ rigs, this Hot Rod Deluxe IV features an Eminence® Cannabis Rex speaker, modified preamp circuitry, smoother-sounding spring reverb and updated aesthetics— flaunting blonde textured vinyl with oxblood grille cloth. 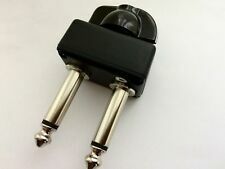 Fender Hot Rod Deluxe amp feet. Condition is Used. Shipped with USPS Parcel Select Ground. ARIGATO GOZAIMASU! Japanese products, I can help you! This is a Receiving orders. From Hiroshima, Far east island Japan! This is a Receiving orders. From Hiroshima, Far east island Japan! If you need ASAP!